Find out how to set up your overheads for accurate and insightful financial reports. Start by selecting Company in the top bar, then click on the Overhead Costs tab. After you enter your overhead costs, Costlocker distributes them among all of the hours your employees spend working. This results in much more accurate tracking of your worked hour costs, making your profitability reports a lot more accurate as well. If you calculate your worked hour costs based solely on your people’s salaries, you’re significantly skewing your project performance results for the better. A client who had just started using Costlocker called us, saying that they had acquired a client with a fee of $10.000, and that Costlocker’s math is probably wrong. When they broke the budget down in Costlocker, it showed them their expected monthly profit of just $220. They were terrified, because they felt that they were selling their people’s time with a significant margin, thinking that if they buy for $10 and sell for $30, they make $20 on each worked hour. That would be true of course, if they didn’t forget to include their office, assistant, vehicle, taxi and other expenses into their costs. In their case, these costs amounted to $18 per every worked hour. Example: Let’s say that the sum of all items entered in Overhead Costs is $10.000. 1600 hours may be the sum of all people’s time commitments, say 10 people, each working 160 hours per month. These commitments are entered when adding a new person (Contracted Monthly Hours). We’ll divide the overheads of $10.000 by 160 hours and get $6.25 that you have to pay on top of your people’s salary. If you pay someone $2.000 per month, that amounts to $12.5 per hour. Only by adding these two values you get the true cost of their man-hour, which is $18.75, no matter if they track time on billable or internal projects. This is only possible with people on monthly salaries Costlocker can’t possibly distribute your overhead costs among the people you pay per hour, because it doesn’t know the number of hours they will end up working the current month. The overheads that get distributed among all the man-hours at your company will only be reflected in the hours that have already been tracked. As this number is often different from what people have in their monthly contracts, the tracked hours sometimes don’t include all of the overheads, but only their part. What you can do about it: Adjust individual people’s commitments (Contracted Monthly Hours) so that they reflect the average monthly hours that they spend at work. This will result in a significantly more accurate distribution of your overhead costs. Any changes in overhead costs will only show in newly created projects. Running and closed projects won’t be affected. Let’s say you want to increase the monthly office rent, because you’ll be moving to new premises in 2 months. Click the item in question – this takes you to its detail. 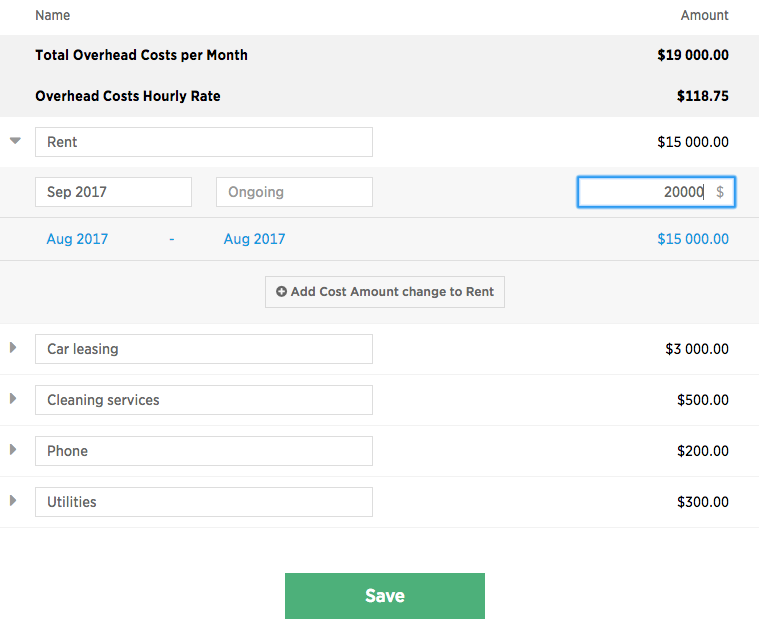 Clicking the Add Cost Amount change to Rent will add a new row within this item and automatically set up its validity from the upcoming month until infinity (Ongoing). 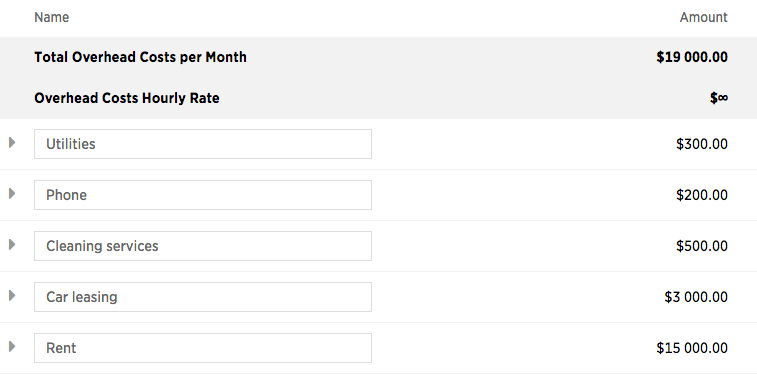 Now you can simply change the month to your liking and enter the new rent fee. Don’t forget to save the change by clicking the Save button on the bottom of the page. Let’s say you subscribe to Costlocker one day and want to add this expense to the rest of the fixed monthly running costs. 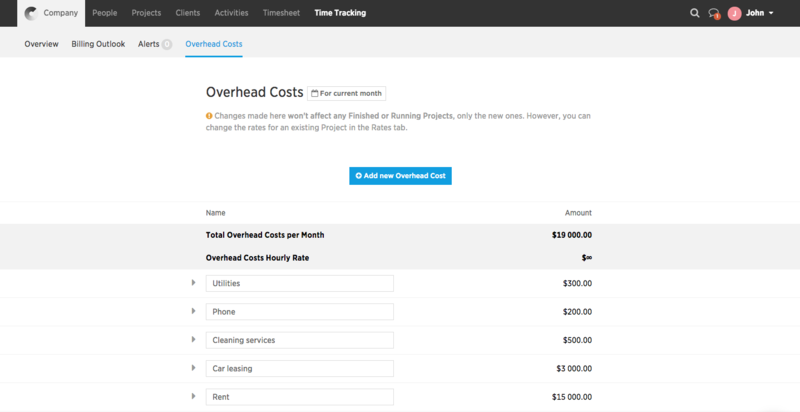 Start by clicking the Add new Overhead Cost button, which creates a new record immediately below it. Please note that this cost item is inactive so far. It will remain inactive until the designated start date, when all the calculations will take it into account. Last but not least, don’t forget to save everything by clicking the Save button at the very bottom of the page. Click any item in the list to see its details. Hover over its line – a red cross will appear. Click the red cross to delete the item and save this change by licking the Save button on the bottom of the screen.